Open your eyes to younger, brighter, healthier looking skin. Eyes often show the first visible signs of aging, but with Obagi Elastiderm Eye Treatment Cream, you can reduce the effects. Designed to jump start the collagen and elastin production in the sensitive skin around your eyes, this revolutionary cream refreshes and ensures that your skin stays exactly where you want it. So, kiss those droopy eyes good-bye and welcome back lighter and brighter skin. 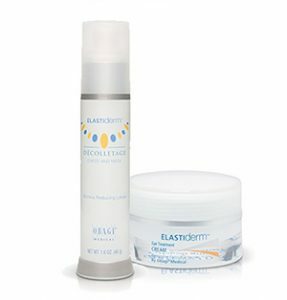 Stimulate the repair of your skin with Obagi Elastiderm Decolletage WrinkleReducing Lotion. It replenishes lost collagen and elastin while increasing the production of new healthy cells, for a younger-looking decolletage.